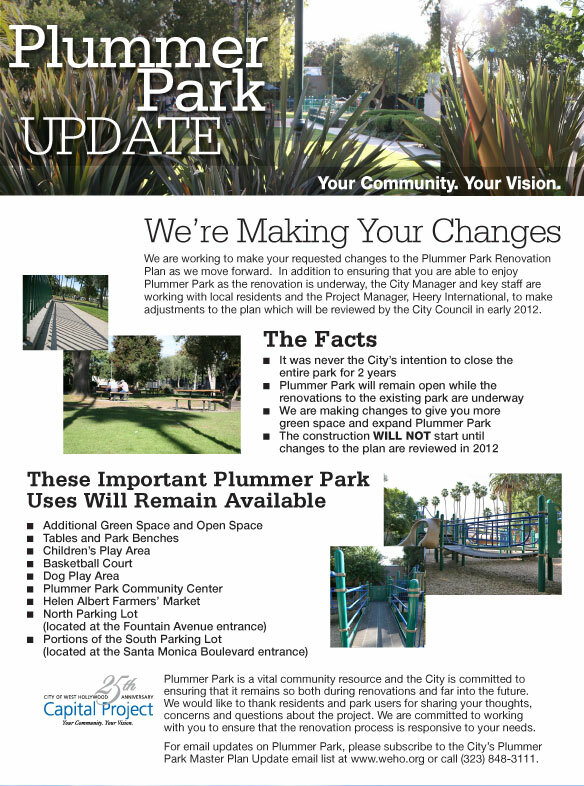 Join our Plummer Park Master Plan Update email subscription. We are working to make changes to the Plummer Park Renovation Plan as we move forward. In addition to ensuring that you are able to enjoy Plummer Park as the renovation is underway, the City Manager and key staff are working with local residents and the Project Manager, Heery International, to make adjustments to the plan. Please be advised that some design elements of the Plummer Park Project may be modified during a review process, currently underway. Please check back for updates, regarding the Plummer Park Project and potential changes. For more information please feel to call 323-848-3111. Plummer Park is a vital community resource and the City is committed to ensuring that it remains so both during renovations and far into the future. We would like to thank residents and park users for sharing your thoughts, concerns and questions about the project. We are committed to working with you to ensure that the renovation process is responsive to your needs.